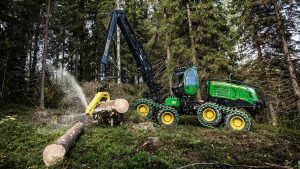 Forestry.com will take a look at the forest machine sales in 2018, World market sales for CTL-machines. Today we start with Finland. After Russia and Sweden, Finland is number three in size of CTL-markets World Wide. When it comes to sales. If you look at manufacturing, Finland is number one! Both John Deere and Ponsse produce all their CTL-gear in Finland and those two companies alone cover over 50% of the global needs of purpose built, wheeled forwarders and harvesters. 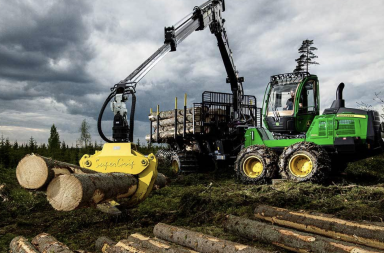 In addition to John Deere and Ponsse we can also find Logset and Sampo-Rosenlew in Finland. CTL-machine manufacturers with small market shares on the domestic market but with growing export to several countries. Sampo-Rosenlew launched an extended product range at the Finnish Metko fair in August last year and it’s a company with muscles enough to take part in a growing world market for CTL-machinery. 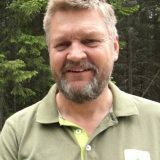 Finnish authorities register both harvesters and forwarders and it’s possible to get detailed information about the market by this information. Last year was a modest year for forwarder sales but a great year for harvesters. 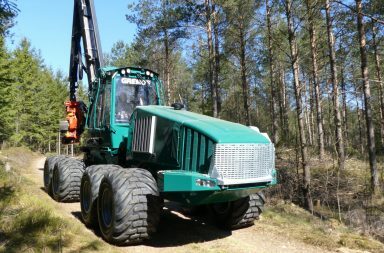 And it’s the midsize 8-wheelers that rules in Finnish logging. Ponsse has the strongest position as market leader in both forwarder and harvester sales with some 40+ percent of the market shares. 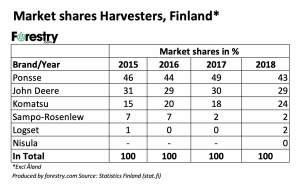 Market shares in figures for harvesters in Finland 2015-2018. Komatsu has increased their share. 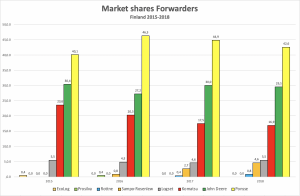 Market shares for forwarders in Finland 2015-2018. Quite stable figures but a small increase for Sampo-Rosenlew. During 2018, global economy in the forestry sector has been strong. All CTL-manufacturers have produced as many machines they have been able to assemble. But the demand has been even higher. Shortage of transmission and hydraulic components has limited the output. 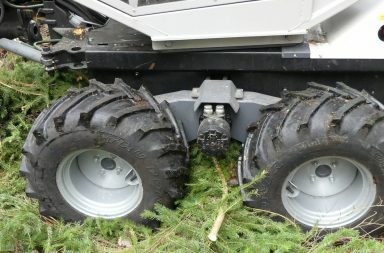 Resulting in reduced sales even though forest contractors have been screaming for a new machine. This have been the case for forwarder sales in both Finland and Sweden during 2018. Less machines sold compared with 2017 but radically increased delivery times. Forwarder sales was down 10 % in Finland (and 17% in Sweden) last year. When it comes to harvesters, the supply has been much better in Finland during 2018. In fact, harvester sales went up with 24 % in 2018 compared with 2017. In total, 322 harvesters was delivered to Finnish customers last year. Ponsse is still market leader (43%) and John Deere no two (29%) in harvesters. 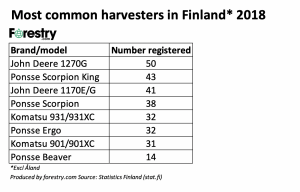 But Komatsu (24%) has gained market shares for harvesters in Finland during 2018 and it’s the new 901XC harvester that stands behind the success. 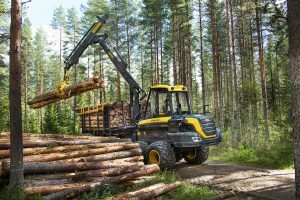 Timo Korhonen, Sales and marketing director of Komatsu Forest Oy, explain’s the strong growth of the Finnish harvester market in 2018. -Ponsse had a great sales success with the Scorpion harvester when it was launched in 2013 and they was delivered in big numbers in Finland. Now these machines have reached their hours and need to be replaced with new gear. The timing for Komatsu has been perfect as we now can offer the 8WD Komatsu 901 XC-harvester for the Finnish market, says Korhonen. This kind and size of 8WD harvesters are the most wanted among Finnish contractors and Komatsu has been able to supply the needs in Finland this year. 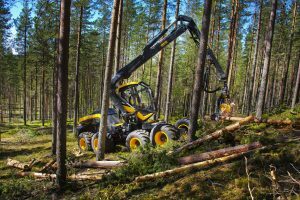 We published an article about Swedish and Finnish forest machine market last year and most of the information is still valid. It’s interesting to compare the preferences of the Finnish and the Swedish CTL-market. 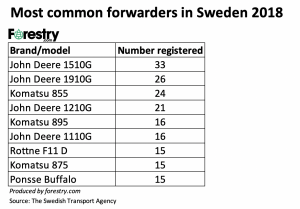 There are only official stats for forwarders in Sweden and here we can see a great difference in distribution of machines in size between the countries. There are no sales at all of either small or XL forwarders in Finland. Most of the forwarders sold have loading capacities between 12-14 tons and the harvesters are in a corresponding size span. In Sweden though, you can find plenty of both smaller and larger machines. Ten tons (load capacity) forwarders are common in south Sweden and XL forwarders (19 ton+) are common in the north but can be found in the south too. -A typical logging site in Finland is 500 cubic meters (500 tons) of standing wood. Part of it might be in a 1-2 hectare (2,5 – 5 acres) of thinning and the other part of it as a final felling harvest. 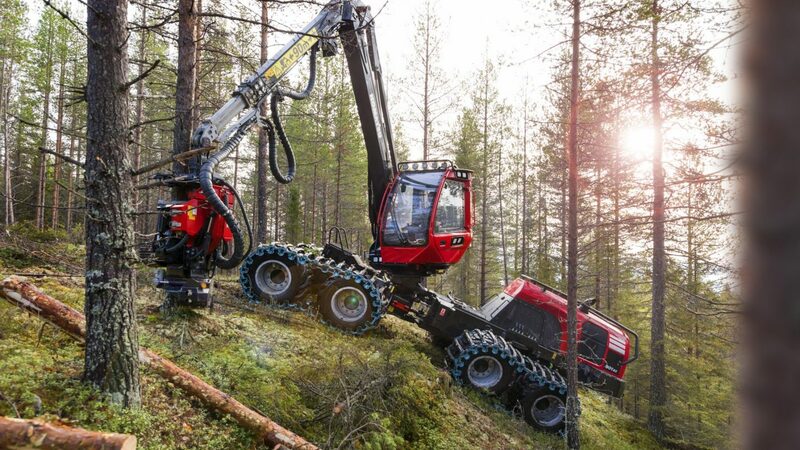 It’s far too costly to transport two different machine crews to the site so the Finnish solution is to have a midsize machine compromise that can handle both the thinning and the final cut, says Timo Korhonen. Another reason that Finnish contractors don’t use the largest forwarders is short hauling distances. The Finnish forest road network is more dense than the Swedish. Average hauling distance in Finland is according to Mr Korhonen appr 250-300 meters (270-320 yd). That might be similar with conditions in southern parts of Sweden. In northern Sweden though, contractors have probably more than the double and prefer forwarders with a higher loading capacity. A third reason for not using the largest machines I Finland, is that it’s quite common to work on soft ground. Finland has a significant share of the forest stands growing on peat soils. 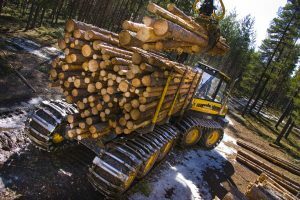 Manufacturers try to offer solutions for soft ground logging as like the 10 wheeled application available for Ponsse Wisent, Elk and Buffalo forwarders. Or the extended boogie offered by John Deere at JD 1210G and 1510G. 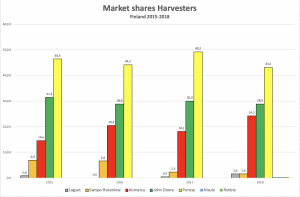 Market shares for harvesters in Finland 2015-2018. Komatsu has increased its market shares. Small manufacturers share decrease. 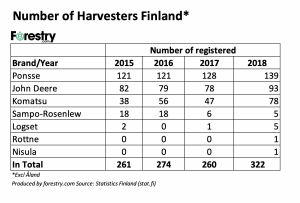 Number of sold harvesters in Finland 2015-2018. Almost all brands have increased their deliveries 2018. Most increased Komatsu who sold 31 more machines in 2018 than in 2017. 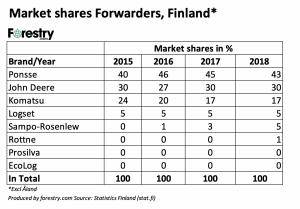 Market shares for forwarders in Finland 2015-2018. Only small movements between brands but a slight increase for smaller manufacturers. 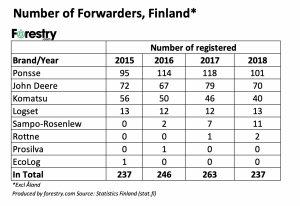 Number of sold forwarders in Finland 2015-2018. Almost all brands have lost sales in 2018 except for Logset and Sampo-Rosenlew. John Deere 1270G is the most common harvester model in Finland. Or Ponsse Scorpion if you put together Scorpion and Scorpion King. 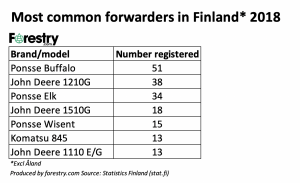 Ponsse Buffalo is the most common forwarder model in Finland. Registered new forwarders in Finland and Sweden 2015-2018. There are more forwarders sold in Sweden than in Finland but the difference has shrunken. Less forwarders was sold in both Finland and Sweden 2018 compared with 2015-2017. 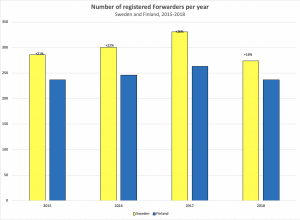 Number of registered forwarders in Finland and Sweden 2015-2016. Due to manufacturers undersupply, both markets had seen decreasing forwarder sales during 2018.